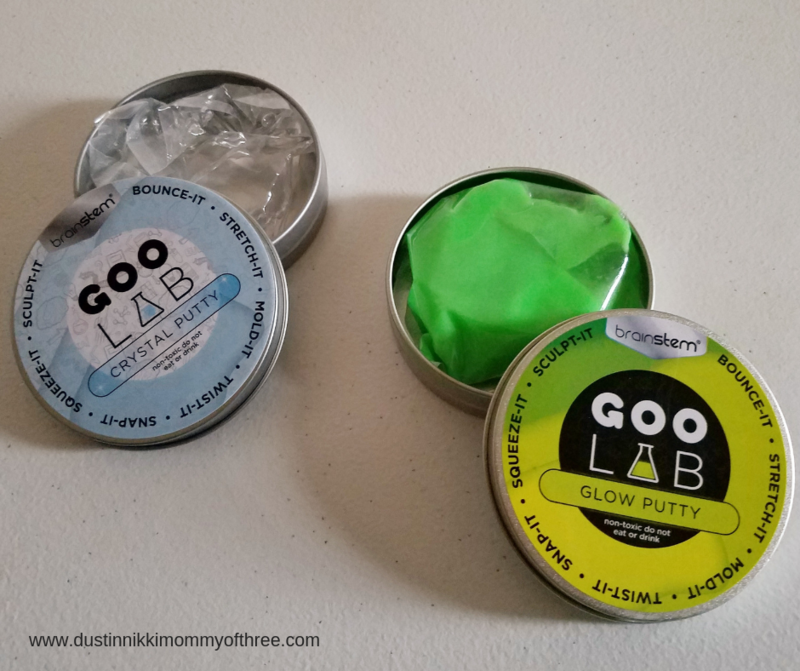 Goo Lab Putty has a little scientific twist to them. There are five different ones you can buy. 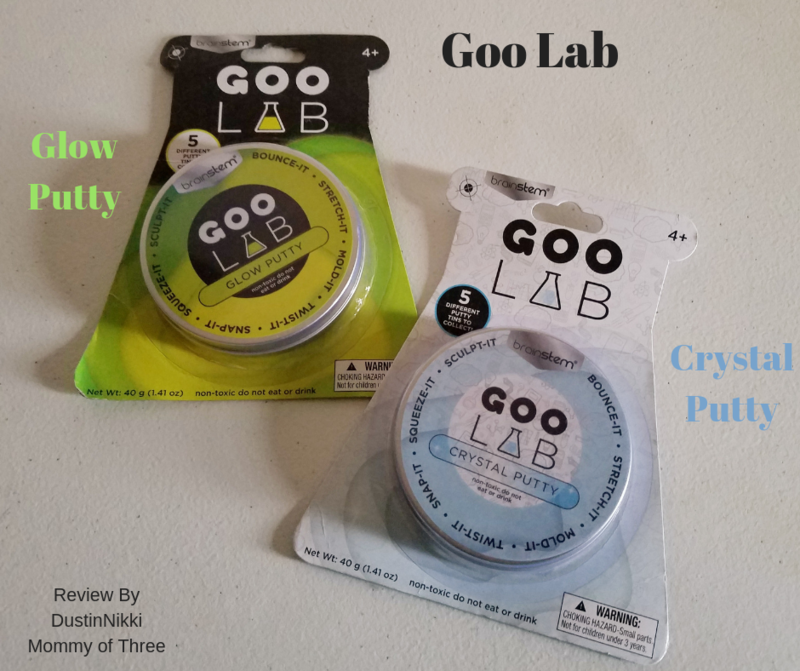 There’s Goo Lab Crystal Putty, Goo Lab Glow Putty, Pearl Putty, Magnetic Putty, and UV Reactive Putty. My boys love these. I need to track down some Magnetic Putty because it just sounds so interesting. The UV Reactive Putty also sounds pretty cool. Don’t get me wrong, they all sound pretty cool and the Glow and Crystal Putty is pretty cool. See, it’s all pretty cool! 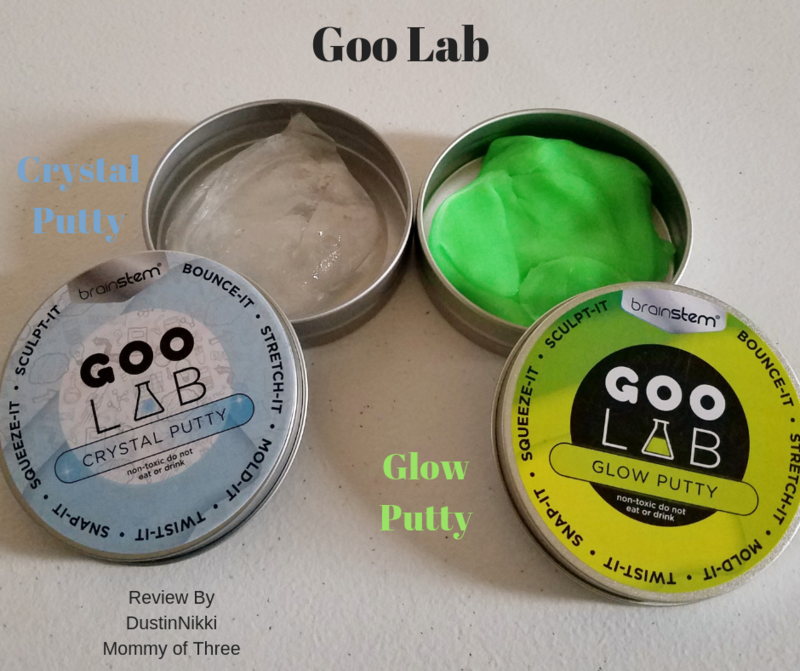 Goo Lab Putty is from BrainStem which is a Bulls i Toy brand. Each putty comes in a storage tin. These tins are pretty durable too. When you first open them, the putty is inside a plastic pouch. Opening them up and getting the putty out of the packaging is pretty easy. They aren’t sticky at all. Then you can use the tins to store putty away when it’s not being played with. The awesome thing about these tins are that the lids are pretty tight. I appreciate this because it helps keep the putty in good shape for a long time with a good seal on the tins. 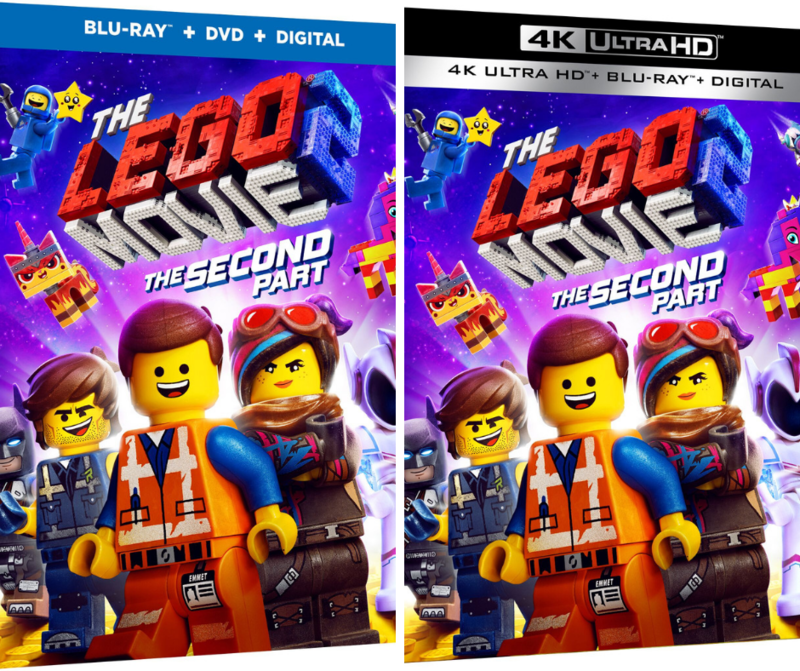 However, the lids can sometimes be kind of difficult to remove. It’s not really a big deal though. If one of my kids can’t get the lid off, they just ask me or their dad to do it. The following goes with both Glow Putty and Crystal Putty which would also go with the rest of them as well. This is putty and not slime. The putty doesn’t ooze or anything like that. You can actually sculpt this putty so there isn’t any runny goo anywhere. You can stretch it, twist it, snap it, mold it, and you can even bounce it! It’s not sticky at all either. At least it’s not supposed to be. 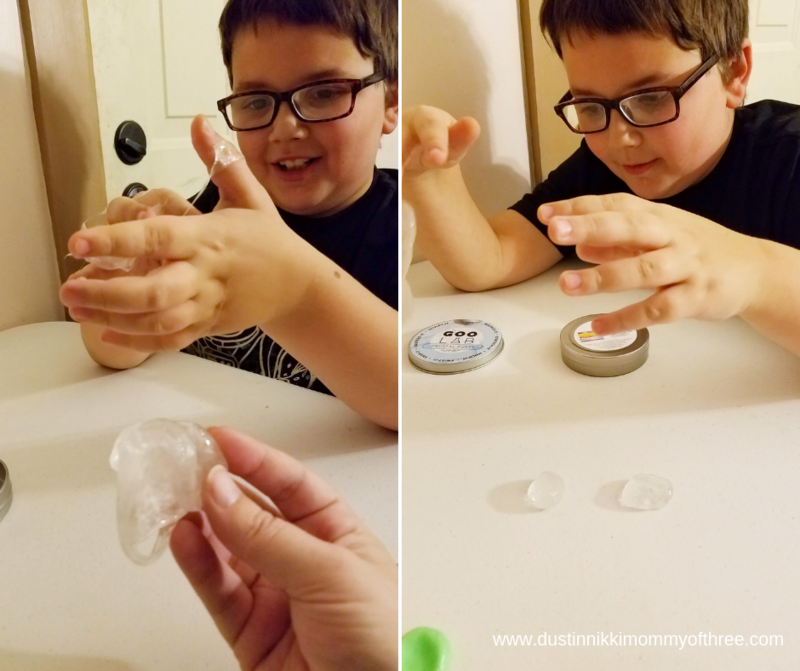 Our Crystal Putty was a little sticky on the surface at first but the more my son played with it, the less sticky it got. And it wasn’t even that sticky really. The Glow Putty was just smooth, never had a sticky feeling at all. The Crystal Putty is now like that too. 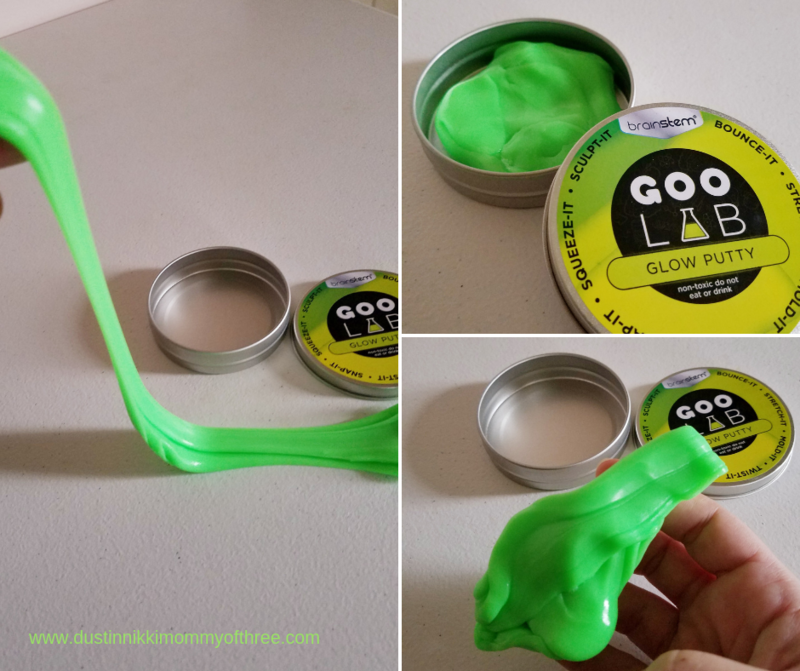 Goo Lab Glow Putty is a bright green color. It’s so bright that it is almost glowing in the light. But it really does glow in the dark! It says to put it in direct sunlight for 20 minutes to “charge” it. You can even just sit it in the windowsill in the tin. We didn’t even have to turn the putty over either. Somehow the whole putty mass glowed without having to do that. Yes guys, it really glows! And it glows really well too. The glow will last a bit of time too. I wish I could have been able to take better pictures but my camera only does so well in the dark. 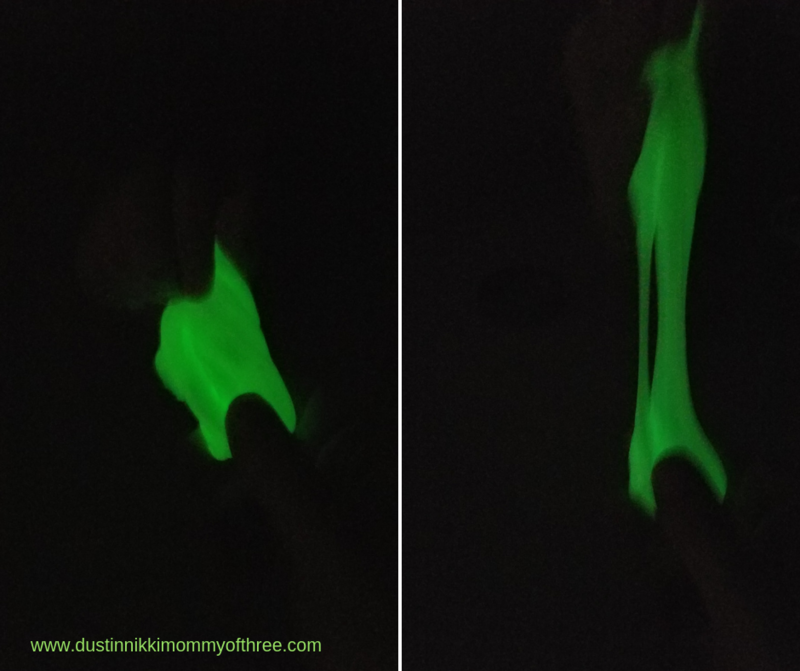 My son thinks this glow in the dark putty is pretty darn cool. It’s so much fun to stretch it and play with it while it’s glowing. It’s fun to stretch and mold it too. My son rolled it out into a rope and then molded it into a snake. The putty holds it’s shape pretty well. It isn’t modeling clay or anything like it so eventually it will start to lose it’s shape. Which is fine because it’s fun to constantly stretch it and play with it. 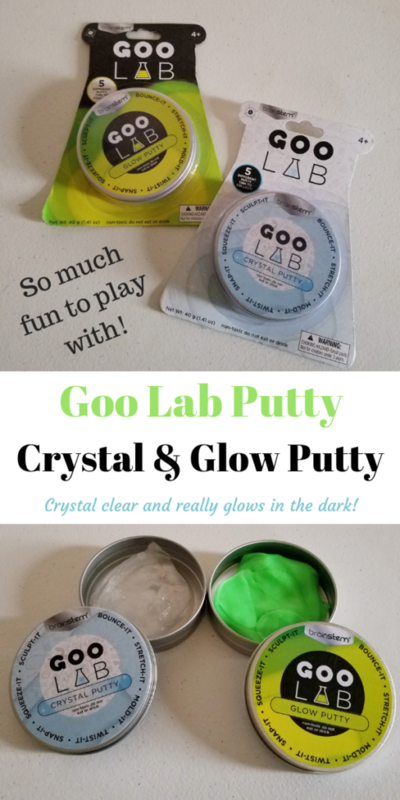 The Crystal Putty can be played with the same way the Glow Putty can. It just doesn’t glow. The thing that is unique about the Crystal Putty is that it is crystal clear. I personally think this is really cool because I have never seen a putty like this before. While you are playing with it, it can become cloudy. But it you leave it sit for about 20 minutes, it becomes crystal clear again. It’s pretty neat! As I mentioned earlier in my review, this putty also bounces! Both of them do. Or rather all of them do. 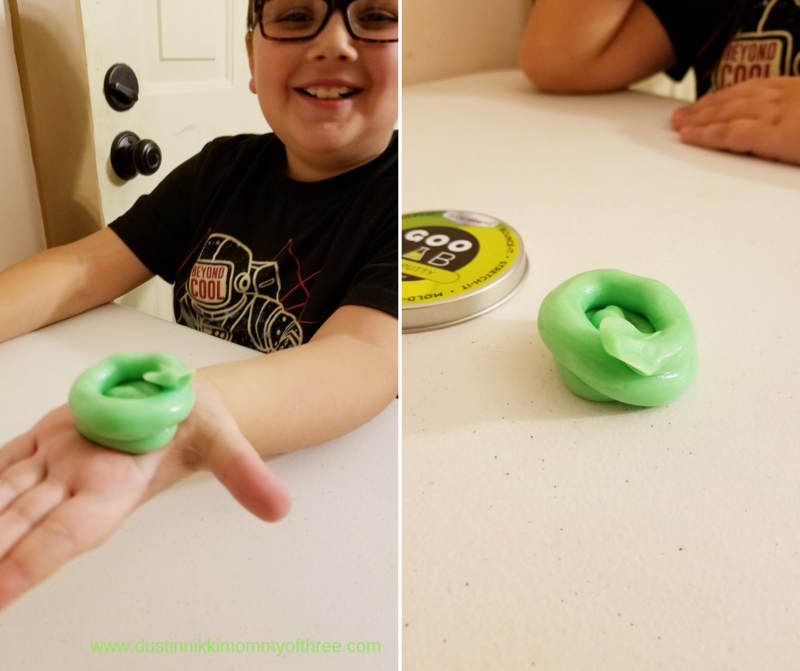 My kids like to make bouncy balls with the putty and bounce them all over the table. It can get a little carried away with how well this putty bounces so fair warning! 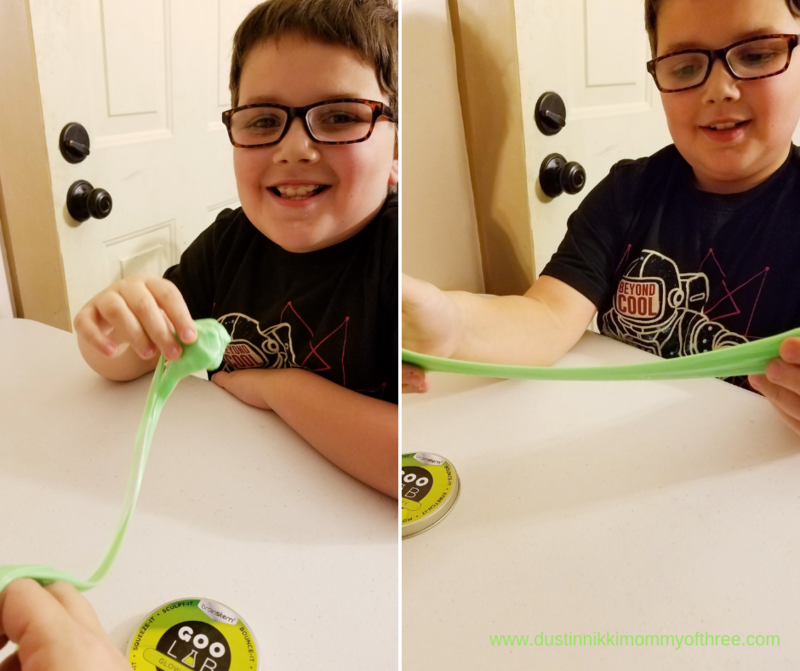 My kids love Goo Lab Putty. I personally think they are pretty cool myself. I like the uniqueness of them too. 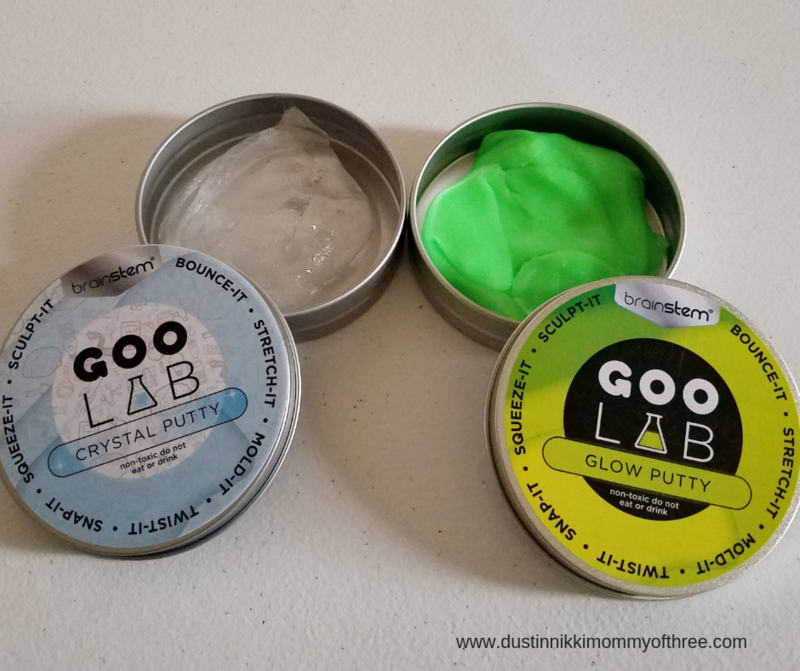 As soon as I find the other kinds of Goo Lab Putty, I will make sure I share our thoughts about them too. I am really curious about the magnetic putty. I really appreciate that they aren’t sticky or have a sticky residue. One of my boys have even dropped it on the floor once or twice and if there was any hair or dirt on it, they were able to just wipe it off. I imagine if it had fallen on the carpet and stepped on, it might be a different story but so far that hasn’t happened. I think these are relaxing to play with to and for kids they are fun for sensory play. They can be a great stress reliever. I have carpal tunnel syndrome and sometimes when I have flareups I find that they can be kind of therapeutic when I play with it too. 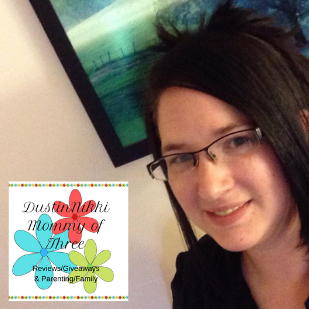 Overall, my kids and I both have been pretty happy with them. These are so fun! 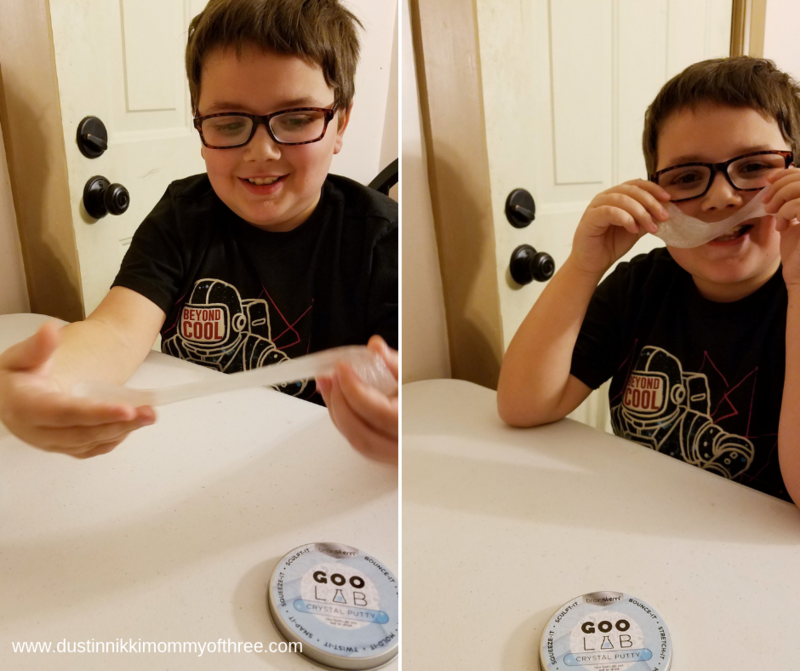 Buy It: You can find Goo Lab Putty at stores like Target. You can find out more information by using the Bulls i Toy link below. 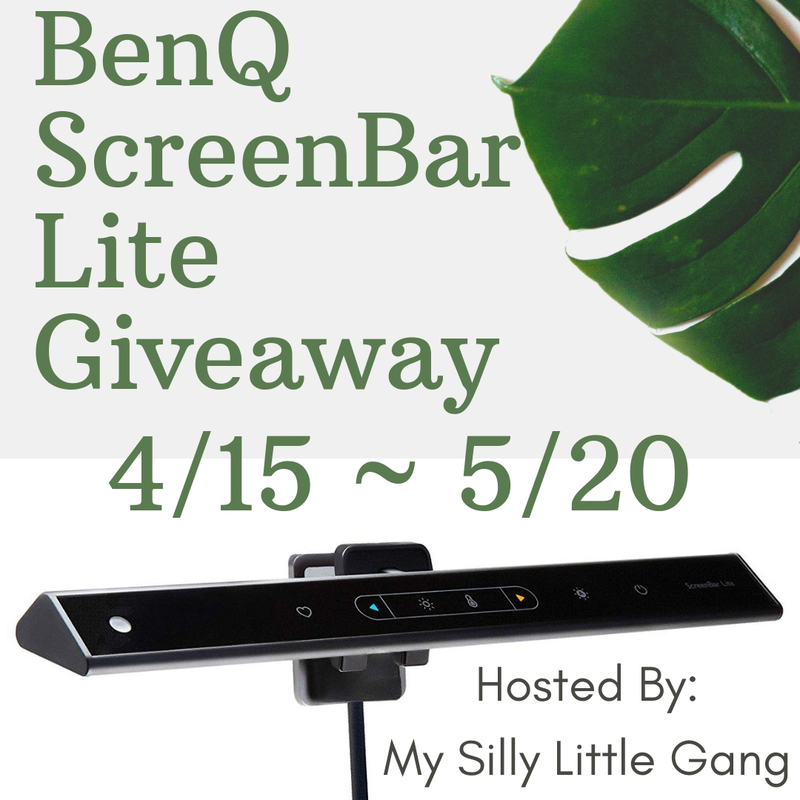 Follow the brands tab and choose BrainStem to see their products!